One of the easiest ways to prepare meat or veggie or fruit meal is just put it on the skewers and grill or bake. I remember the first time I ate kabobs, that was long time ago, we had this funny looking electric grill that had opening top with heater that was turning completely red while cooking. My father liked to make it with pork, bacon and pepper. My mother liked it with pork, bacon and onion. 0_o And I just liked all of the versions. Now, I make kabobs when I don’t have ideas for a dinner. It’s easy and there is a never ending amount of flavors that you can put together. This time I made… surprise, surprise… CHICKEN kabobs 0_o One of my specialties are shrimp kabobs marinated in my secret ingredients 😛 and I managed to buy not very expensive shrimps lately so I’m going to make it sooooon. Cookies is jumping up and down, as he is so excited 0_o. ½ big red, yellow or green pepper. I had red and white one. spices: for lazy ones – spice for poultry. After you clean and dry it, cut meat into bite size chunks, set aside. Cut pepper into flat pieces, not bigger than chicken. Cut onion into slate like pieces, I usually cut onion into 4 pieces and separate layers. All the big chefs say to put wooden skewers into cold water for an hour, so they do not burn, but I always forget it and just make it. Make the skewers by skewing prepared ingredients in this way: chicken, onion, pepper, chicken, onion, pepper, chicken, onion, pepper…. uff until you finish all the ingredients. On each of mine usually fit 5-6 chunks of chicken. 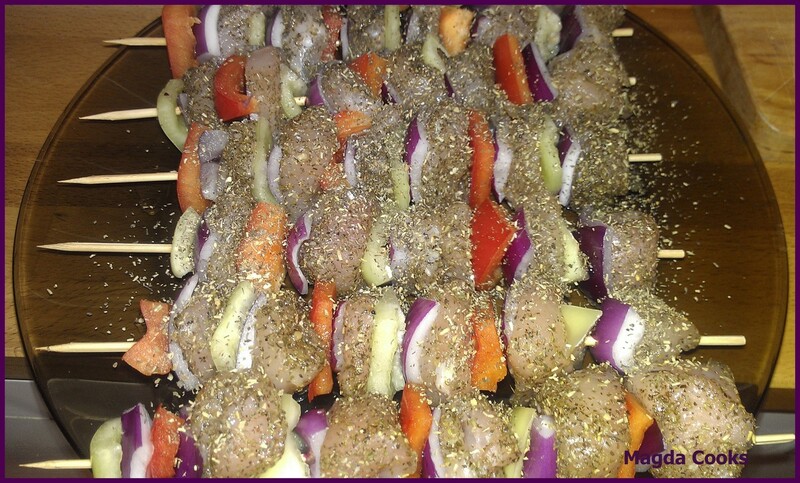 Set kabobs anywhere and use spices, sprinkle with oil then grill until golden brown. P.S. Cookies thoughts: Works for me, even if it was “CHIX” again… Magda Cooks, it JUST RIGHT!